From the very beginning, the store’s location required its operators to meet the needs of two different clienteles. Major factories such as a Ford Motors plant occupied the area to the south and east. Homeowners and apartment dwellers lived to the west and north. A lot changed over the years. The Six North Apartments and Marian Oldham Station post office new occupy the grounds where the farmers market once stood. The factories closed, and the buildings that housed them became loft apartments and tech business incubators. The Central West End went into a long, slow decline and then rebounded vigorously. New Market Hardware remains fundamentally unchanged, however. We continue our commercial operation, servicing institutions and businesses. Still, we remember that we are first and foremost a “hardware store,” accessible to anyone needing materials for their residence or business. Call us or pay us a visit. Real humans answer the phones here. When you walk in, you are not on your own. A knowledgeable hardware person will discuss your needs, locate your merchandise, provide you with a handwritten receipt, and help get your purchases to your vehicle. We even have a very friendly cat to help you feel welcome. 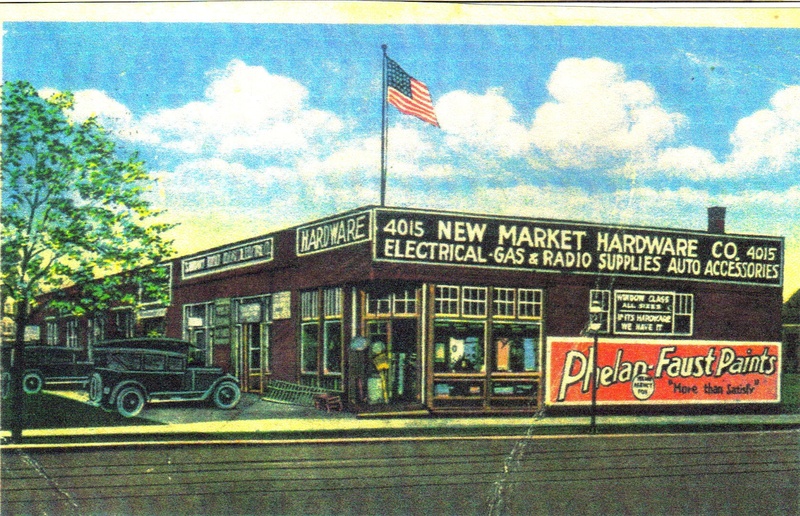 New Market Hardware got its name from its original location. The business opened in 1914 at 4015 Laclede Avenue in the “new” farmers market (the “old” market being Soulard) complex at Sarah & Laclede. When Prohibition ended, the business moved across the street to larger quarters in the former speakeasy at the southeast corner of Sarah and Laclede. The thriving operation eventually expanded into the adjacent storefront, which once housed Laclede Music, a mecca for hip St Louis music lovers in the 50’s and 60’s.